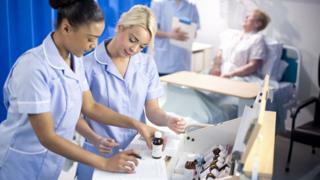 Brexit poses an "immediate risk to the provision of safe and effective care" for patients in the UK, according to the Royal College of Nursing. The union has made the warning in a letter to leaders of the UK's main political parties on behalf of its 435,000 members. It also wants the parties to back a second referendum on any Brexit deal. A government spokeswoman said plans are in place to ensure patients receive the same standards of care after Brexit. The UK will leave the European Union on 29 March 2019. In the letter, Maria Trewern, chair of council at the RCN, wrote: "As the debate across our membership has made clear, the implications of Brexit for the health and care system will be numerous. "There are risks that, if not credibly addressed, may damage population health, as well as severely impact on our members' ability to provide safe and effective care for their patients in both the short and the long term." The letter warned that Brexit could exacerbate ongoing problems in the NHS, such as workforce sustainability. The union also said that it could have particular implications for nursing staff providing care in areas that interface between Northern Ireland and the Republic of Ireland, along with threats to fair employment practices, workers' rights and cross-border exchange of knowledge, research and skills. The letter said the union is backing a second referendum on any final deal for Brexit to "give citizens the opportunity to make an informed choice and vote on decisions that will affect generations now and in the future". A Department of Health and Social Care spokeswoman said staff from the EU were a "vital part of our NHS and social care workforce" and will have "an important role to play in the future of health and social care in this country". She added: "We are preparing for all situations, including a no-deal Brexit, and we have worked closely with partners to draw up contingency plans that will ensure patients continue to receive care in exactly the same way they do now."